While listening to Future Day, the David Finck Quartet’s debut album newly out on the Soundbrush label, I found myself returning again and again to one thought. It’s so doggone good that the only mystery is — why did the talented bassist wait so long? Over the past three decades, Finck has worked with some of the biggest names around, including jazz legends Herbie Hancock and Andre Previn, and he’s also become a top choice as an accompanist for countless entertainers, ranging from Natalie Cole to Sinead O’Conner. In the process he has become one of the most respected musicians around, and was long overdue to take the next step. Drummer Joe La Barbera has a résumé that includes service in Bill Evans’ last trio, while vibraphonist Joe Locke is a talented veteran who has led his own groups. Pianist Tom Ranier is a multi-talented musical wizard who can play several instruments, in addition to being a fine composer and arranger. Also showing up on a couple of tracks are guest artists Bob Sheppard on tenor sax and Jeremy Pelt on trumpet, and both possess impressive backgrounds too. With this much talent on board, combining with a thoughtful and varied selection of pieces, it’s not surprising that this is the most polished debut album I’ve heard in a long time. The twelve tracks are equally divided between new pieces written by members of the quartet and solid established standards, but the standards have been given arrangements that help provide a cohesive theme for the entire album. It starts with Finck’s solid, warm and rich tone and technique, which forms a base for every piece. Of course, there’s nothing wrong with his solo play, as showcased on “If Not For You,” a tune written by drummer La Barbera that’s based on Gershwin’s “But Not For Me.” But much of the time Finck generously turns over the spotlight to the others and they don’t disappoint. Vibraphonist Locke is probably the most ubiquitous, and his precise and complex play shines whether he’s providing a flow for the others or soloing, as with his turn on “Nature Boy” — probably my favorite on the album. Running a close second might be “Four Flags,” a driving tune written by Bevan Manson that features both of the guest soloists on extended solos, along with a fast-paced drum lashing furnished by La Barbera. I also enjoyed the quartet’s take on Wayne Shorter’s “Black Eyes,” which is dominated by Locke’s incredible solos. For a softer side of the quartet, try “Transparency” and “New Valley,” both of which allow pianist Ranier to demonstrate his keyboard virtuosity. The latter piece has a nice bit by Finck too. Point of fact – and I don’t say this often – every track on the album is a good listen. 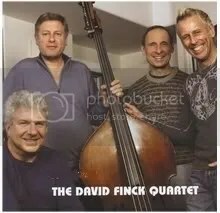 An outstanding debut album by the David Finck Quartet, and hopefully just the first of many.